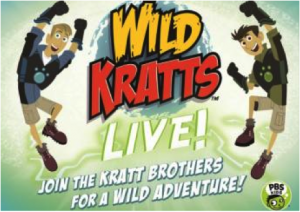 Smarties, are you ready to get WILD with the WILD KRATTS? We have the perfect giveaway for you!!! The wildly popular PBS KIDS® television show, WILD KRATTS, is coming to the LIVE stage. Animated Kratt Brothers, Martin and Chris, “Come to Real Life” in a classically Wild Kratts story. Off “To the Creature Rescue” the Emmy nominated Kratt Brothers activate some fan favorite Creature Power Suits to confront a comic villain. Through HILARIOUS pratfalls and AMAZING animal ‘WOW FACTS’ the Wild Kratts team rescues their favorite invention from Zach’s clutches so the animals of the creature world are safe once again. One lucky Smarty will WIN (4) Tickets for the Saturday, February 13th show at 4:30 pm. 1. Leave a comment below answering this question: Valentine’s Day—Chocolate or Flowers? 3. Double your chances of winning by following CSP on Instagram. We will pick a winner February 8th. STAY TUNED SMARTIES!!!! I prefer white roses for Valentine’s, my favorite! Chocolate, preferably covering a strawberry.